With impressive power and a brushed-aluminium design, the Maxdata ECO 4510 IW (£699 inc. VAT) passes for a more expensive laptop. Only poor mobility and basic 3D power reveal the budget roots of this otherwise excellent system. The chassis is strong and stylish. This quality extends to the user interface, as both the keyboard and touchpad are well-designed and highly usable. While its 2.9kg weight allows for moderate mobility, the 144-minute battery life won't get you far. In day-to-day use, we found ourselves with a flat battery on even short journeys. To increase mobility, you can buy spare batteries. Costing just £25 (inc. VAT) each, this makes a cost effective option. Suiting multimedia and office work, the 15.4-inch Super-TFT screen is bright and sharp. The glossy coating increases reflections but improves colour and brightness, making it ideal for viewing and editing photos. A good package of software is included to get new users up and running. Microsoft Works provides basic tools for the home office, while BullGuard Internet Security keeps you protected against internet threats. 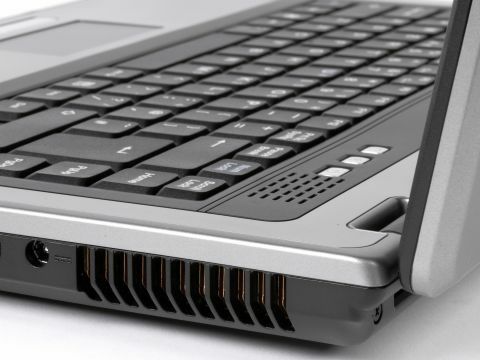 Dual-core power is provided by an Intel Core 2 Duo processor, backed by an impressive 1536MB of memory. Performance is lower than most of its peers in this test, but still ample for multi-tasking and running home and office software with ease and speed. 3D performance is basic at best. The integrated Intel graphics chip means gaming is restricted to basic games. However, this low performance doesn't restrict multimedia use, so you can easily edit short home movies and watch DVDs. For saving your digital media, a 120GB hard drive provides ample storage space. A dual-format DVD rewriter lets you save files to DVD and CD. A 4-in-1 media card reader can also be used for storing and sharing data with external devices. Wireless networks can be accessed at high-speed. Using the built-in 802.11a/g Wi-Fi card, you can connect to hotspots in the UK and abroad. Fixed home and office networks are limited to the slower 10/100 Base-T Ethernet, but this won't be a problem for most users. With a strong specification and high-quality design, the ECO 4510 IW has plenty to recommend it to home users. However, since its price and performance are bettered by other laptops around, Maxdata has some pretty stiff competition.